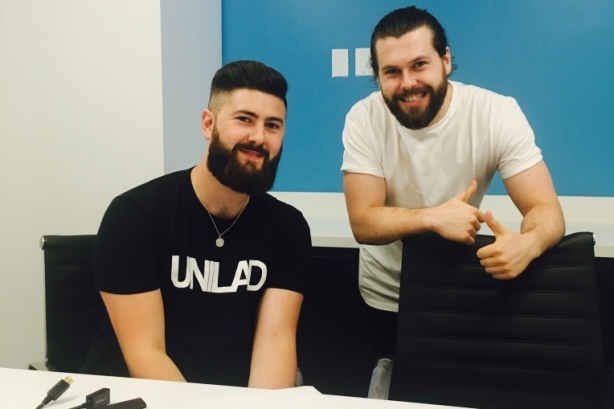 Sam Bentley and Liam Harrington, aged 25 and 24, respectively, founded media brand Unilad two years ago and can now reach half of the world's Facebook users. Harrington: It is an online platform for millennials by millennials. We specialize in content that is trending, relatable, and sharable. Bentley: We were a Facebook page before we were a website, unlike other traditional media platforms that have gone from being a website into social. You have English offices in Manchester and London: Tell us about your U.S. plans. Harrington: First up, we are moving into New York, looking at hiring a team of staffers and opening an office in Brooklyn, then opening in Los Angeles. There are 1.7 billion people on Facebook and we reached over half of them in one week in August. We built our business and model on a balance of bringing in money, revenue, and putting out great content. We are already worldwide, so the plan is to grow a commercial team in the U.S. and build on top of that into the content. Will you do anything different for an American audience? Harrington: We want to nail American politics and sports. We want to be the place in America creators come to. Unilad has more than 15 million Facebook followers, 30 million monthly unique website visitors, and attracts 2.7 billion video views per month. How did you do this? Bentley: We are quick on our toes. We start things before other publishers because they are going through 10 layers of management before even talking about it. It’s about being proactive and reactive to people’s opinions. How do you decide what content to put out? Harrington: As Mary Poppins said, "A spoonful of sugar helps the medicine go down." Traditional media suggests if you follow a serious news outlet you can only look at serious news: You can’t then go and watch a funny video. We are trying to give people the sugar – lots of humor and positivity – and the medicine is our meaningful stuff. [The fun content] helps people digest [the serious stuff]. Harrington: We want to make changes around issues like homelessness, education, and mental illness. We are hoping one day that, instead of the funny video on our page getting 150 million views in 24 hours, it’ll be a piece on mental illness. We recently live streamed the Homeless World Cup. Last year, it only got 6,000 views of its YouTube videos for the whole tournament, but we broadcast five games this year and got 3.5 million views. That changes its whole future, because it can go out next year and get bigger stadiums, bring in more brand deals, and more sponsorships. We are going to do the same thing with them next year. How many journalists do you employ? Bentley: Twelve - we train people to handle social and write articles. Harrington: People also create videos for us similar to AJ+ - video is the way forward for editorial. What is Unilad’s biggest challenge? Harrington: We do not take investment because we want to retain control of the company. We have 65 staffers, two offices, and we are growing massively. We are keeping youth and bringing in a new wave of talent, rather than the old people who are just going to bring it back down to where media was. What brands do you want to work with in the U.S.? Bentley: Paramount, Universal, Warner Bros., and all the gaming companies - there is a natural synergy between them and our audience. How have you worked with brands in the past? Harrington: We worked with Lions Gate to promote its Dirty Grandpa film. We came up with the idea of having an old man walking down London’s Oxford Street, rapping. Everyone was shocked and recording him on their phones. We uploaded the video to the web and put the trailer at the end. We then broke the news it was a viral campaign for Dirty Grandpa. Harrington: We like to take ordinary people - "Joe Bloggs" - on the street that are filming content. We then see if that content can work 10 times over. If it can, we work with that person and grow their social media platforms, turn them into a public figure, and bring them into our commercial content so they can start earning money from what they are creating.